Tiffany Foster and Melody des Hayettes Z. Photos © Sportfot. Wellington, FL – March 26, 2014 – The final week of competition at the 2014 FTI Consulting Winter Equestrian Festival (FTI WEF) kicked off on Wednesday with a dual victory for Canada’s Tiffany Foster and Germany’s Daniel Deusser in the $34,000 Spy Coast Farm 1.45m speed class. Due the large number of entries, the class was held in a ‘California Split’, and awarded two sets of placings with $34,000 for each section. Foster and Artisan Farms LLC’s Melody des Hayettes Z topped Section A and Deusser and Stephex Stables’ Domingo were the winners of Section B.
FTI WEF week twelve, sponsored by FTI Consulting, runs March 26-30, 2014. Thursday’s competition will feature the $10,000 Gut Einhaus 5-Year-Old Young Jumper Classic, the $34,000 G&C Farm 1.45m, and the $50,000 Ruby et Violette WEF Challenge Cup Round 12. Friday will host the $15,000 Adequan 6-Year-Old and $20,000 Adequan 7- and 8-Year-Old Young Jumper Classics. The $100,000 Suncast 1.50m Championship Jumper Classic Final and $500,000 FTI Consulting Finale Grand Prix CSI 5* will be held on Saturday along with round one of the $50,000 USHJA International Hunter Derby, which concludes on the derby field on Sunday. Live streaming is available for two events this week. Watch them at the following links. Thursday, March 27, 2:30 p.m. EST: $50,000 Ruby et Violette WEF Challenge Cup Round 12: http://www.chronofhorse.com/article/2014-wef-challenge-cup-round-12-live. Saturday, March 29, 6:30 p.m. EST: $500,000 FTI Consulting Finale Grand Prix CSI 5*. Live streaming will begin at 6:30 p.m. with the $100,000 Suncast 1.50m Championship Jumper Series Final Jump-off: http://www.chronofhorse.com/article/2014-fti-finale-grand-prix-live. Anthony D’Ambrosio (USA) is the course designer in the International Arena for week twelve. In Wednesday’s $34,000 Spy Coast Farm 1.45m, D’Ambrosio saw 97 entries over his speed track with 31 clear rounds. Tiffany Foster completed the fastest clear round in 61.01 seconds overall for the win in Section A of the class riding Melody des Hayettes Z. Daniel Deusser finished in 61.41 seconds with Domingo for the win in Section B. With the split class, the top three finishers in Section A were Foster and Melody des Hayettes Z, followed by Reed Kessler (USA) and Kessler Show Stables’ Soraya de l’Obstination in 63.23 seconds, and Darragh Kenny (IRL) with Eva Castegren’s Alpha VDL in 63.52 seconds. In Section B, Deusser and Domingo led the way over David Will (GER) and Eveline Kraus’s Black Jack 163 in 63.25 seconds, followed by Eiken Sato (JPN) with Stephex Stables’ Q Royal Palm Z in 63.55 seconds. With the win in Section B, Daniel Deusser has added to his experience in the winners’ circle with his mount, Domingo, but until Wednesday, a win had eluded that pair in Wellington. 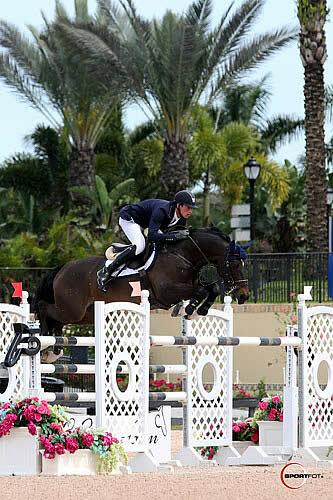 Domingo shows again in Thursday’s 1.45m and then he is done for the winter in Florida. Deusser then looks forward to Saturday night’s $500,000 FTI Consulting Finale Grand Prix CSI 5* with Cornet d’Amour, who jumped a clear warm-up round with time faults in Wednesday’s class. Also showing in the International Arena on Wednesday, Ben Maher (GBR) guided Amy Carr’s Charmeur to victory in the $1,500 Adequan 7-Year-Old Young Jumper speed class. Laura Chapot (USA) won the $1,500 8-Year-Old Young Jumper speed round with Out of Ireland, owned by The Edge. Chapot was also second in the 7-Year-Old class with Mary Chapot’s Cast a Dream. For full results, please visit www.showgroundslive.com.